It has been 10 years from the very first day I came to Fisher Village with a group of international volunteers since when I was a student. In my vivid memories, there were 40 people living on the temporary ragged boats that were surrounded by rubbish. You can imagine the surprise I must feel. The village is located on the Red River bank which is just around 20 minutes walking distance from the city-Hanoi but their lives are so different comparing to the busy and modern life in the city. No stable jobs, no education, no clean water, no medical station, no safe playground for the children, they have to live in such poor living conditions. After joining in some work camps (short-term volunteering projects) to help the people there, life kept me busy with other plans in a way that I somehow did lose contact with the people there and no much charity work I could take part in. A twist was that a few months ago, I was introduced to the project Threads and needless to say, I decided to join in undoubtedly. The day when I came back to the Fisher Village, I realized that there are no significant changes in the village. They are now 76 people living in the village. With support from some NGOs, the children can take a chance to go to school. Still, the adults are struggling to find a way to earn a living that allows them to make ends meet. The financial burden on the faces says it all. They hunger for any training to obtain new skills. That way, they can get better income to change their lives. The women in the Finish Village are considered as breadwinners of the households. It is easy to see their passion and diligence. There is no better time than now to teach them “how to fish” to have independent lives. It is easy to be left with the feeling that we are powerless and nothing will be done. 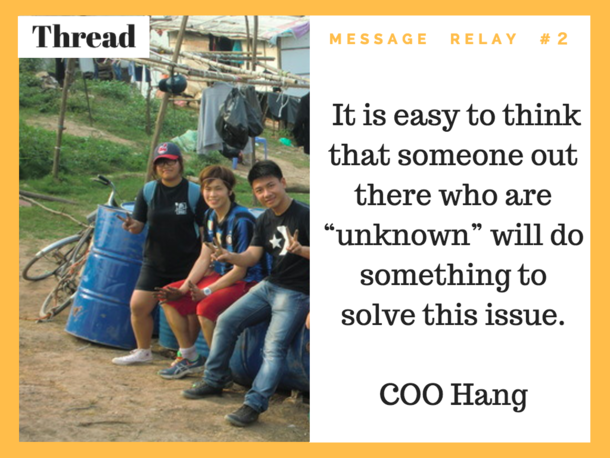 It is easy to think that someone out there who are “unknown” will do something to solve this issue. There is no use in waiting for things to change. I always believe that we can be a chance to change. What Threads does: do whatever it takes. For those women in Fisher Village, it is hope.